When I was in Taiwan (a long long time ago), I’d start speaking to a vendor, and they’d immediately say, “ABC”, nod, and go on with their answer to whatever my question was. It was a little odd that everyone wanted to clearly acknowledge and label me as an American Born Chinese. It was obvious from my accent, or long hair (school girls are not allowed to have hair past shoulder length), or being XXL by their standards (which is a size 2 in the US). Being Chinese-American does influence a lot of who I am, including my taste and cooking. I have a well-stocked pantry of both Chinese and Western ingredients, and often I like to play with the blending of the two. 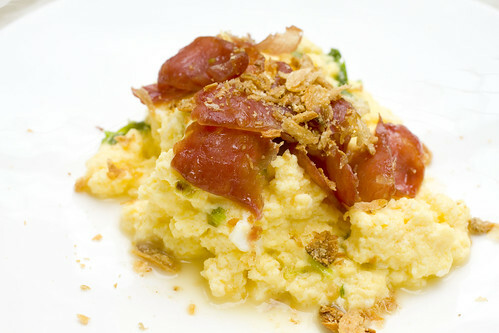 When some of my cousins stayed with us, we decided to try these alternative scrambled eggs on them. 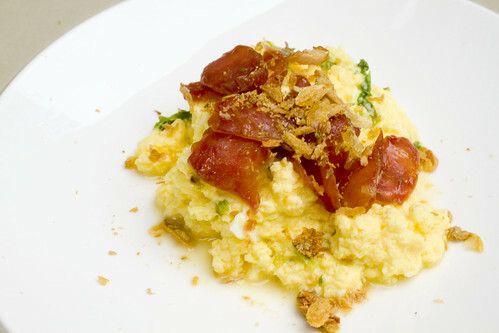 It’s inspired by the Gordon Ramsay technique for making scrambled eggs, but flavored with some Asian accents. 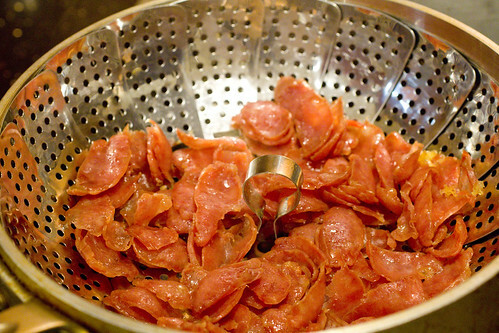 Chinese pork sausage and fried shallots can be purchased at any Chinese supermarket. You can also make your own fried shallots. I will be serving this to guests again! 1. 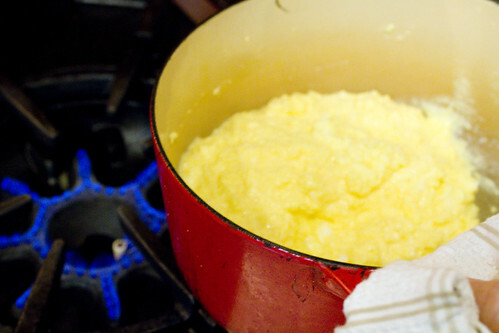 Heat 1/2 tablespoon butter in a small non-stick pan. 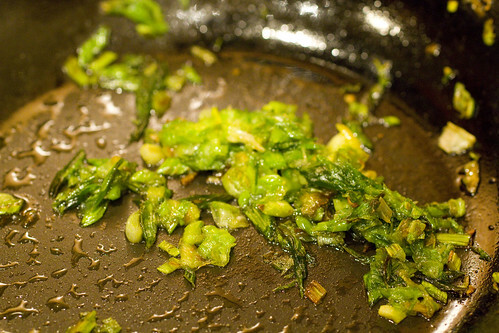 Saute scallions until softened. Remove from heat and set aside. 2. Steam sausage until warmed and tender, about 3 minutes. Set aside covered. 3. 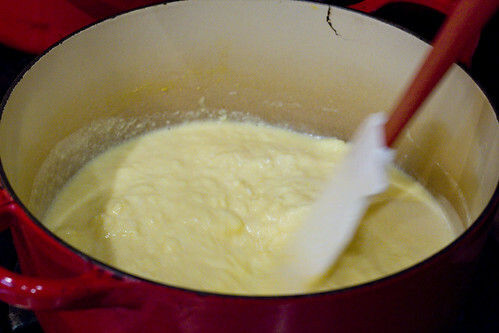 Crack eggs into a medium sized pot (cold). Break the yolks. Add sour cream, remaining 3 1/2 tablespoons butter and sesame oil. 4. 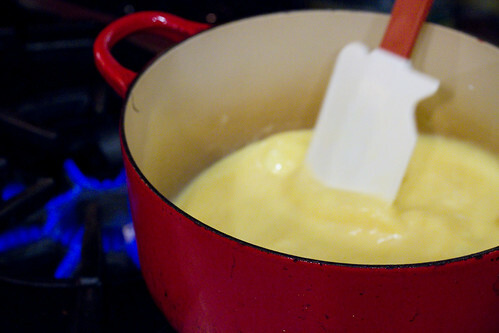 Bring it over medium-low heat and stir with a rubber spatula constantly and quickly. You can move it on and off the flame to control heat as it thickens. When almost to desired consistency, remove from heat, season with some salt and add reserved scallions. 5. Divide into 4 serving, plate and top with Chinese pork sausage and fried shallots. Serve with sriracha and toast if desired. Eat immediately. posted by jessica	at 10:45 AM	Filed under Fusion, Recipes. You can follow any responses to this entry through the RSS 2.0 feed. Both comments and pings are currently closed. This is exactly why I find your blog inspiring. So inventive, and I love that you always have a foundation that is clear, in every single recipe. You rock. I taught this graphic novel last year, and my students *loved* it. If you haven’t read it, let me know. I have a little Amazon credit I’m itching to use, and I’d love to send it to you! Thanks EMC! I don’t know about that book but would love to read it. You are too sweet! How fun! Chinese pork sausage is the best. 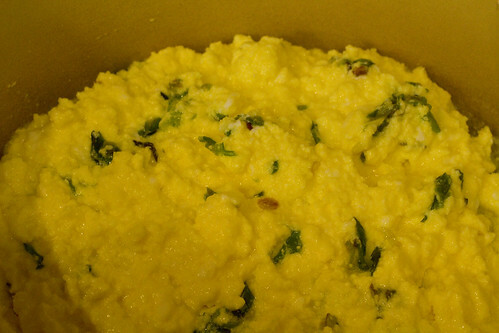 If you knew how many times friends have asked “why can’t I get creamy scrambled eggs?”!! Super recipe. Sour cream is a surprise ingredient! Think I will use bacon or maybe even proscuitto. I love it…thanks for sharing! 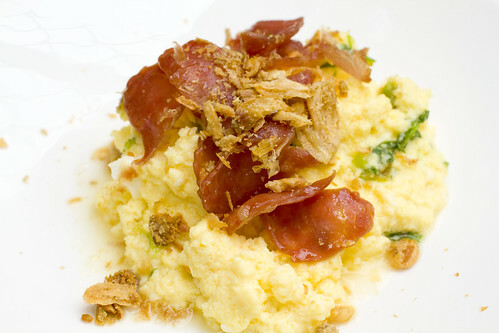 Love chinese sausages in omelette but have never had it with scrambled eggs, great idea! Ordered today–hope you love the graphic novel as much as I do!